Bad has never been so good. Armed with the superpower strength of a clever concept and expertly executed in exciting 3D action, DreamWorks’ latest family comedy Megamind is the perfect match of laugh-out-loud hilarity and big-blue-hearted warmth. As the vocal talents of Will Ferrell, Tina Fey, Jonah Hill, and Brad Pitt join forces in this fun and surprisingly clever animation, the oddball characters soar above other family movies with panache and an abundance of laughs that will have both adults and kids cheering for the bad guy. From early beginnings, Megamind (Ferrell) has always had a difficult time fitting in with human beings due to his looks and misjudged powers that contrast with the handsome face and controlled strength of his nemesis Metro Man (Brad Pitt). So with a lack of friends and much needed love at a young age, Megamind decides being bad is the next best thing. 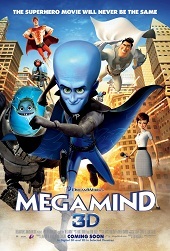 But unlike most villains, Megamind doesn’t necessarily set his sights on winning, but rather on continuing his battles with the celebrated superhero Metro Man in order to get the attention of Metro City citizens. It isn’t until Megamind accidentally conquers Metro Man, however, that things get out of hand. As the conventionally clear-cut distinction between good and evil is playfully subverted in Megamind, it is the movie’s strong concept that bolsters the lovable characters, clever storyline and the heart-warming lessons to be gained. Despite his alien looks, Megamind is given a human touch as his yearning to be loved and the loneliness that he tries to combat with evil appearances are brought to life through Will Ferrell’s well-balanced vocal performance – seamlessly morphing from over the top evil laughs to more subtle humour. As a result, audiences aren’t continually bombarded with loud, obnoxious jokes, as you might expect from such a cast of comedic superstars, and the movie has its share of moving moments without being too sentimental or moralistic. As the story takes twists and turns that are both surprising and cleverly constructed, the notion of what it takes to be a real hero is made clear without having to hit us over the heads with cheesy lines or blatant information spoon-fed into our eyes. And while many of the jokes depend on pop culture references and quick-witted irony that youngsters may not fully comprehend, there’s enough action and visual excitement to keep them watching to the end as bright colours, flashy gadgets and catchy songs give bad a good name. With so many animations following the increasingly popular trend of three-dimensional storytelling (and getting a few extra bucks out of it too), Megamind is one such animation that takes advantage of this mode of viewing in a way that doesn’t shove objects in your face. The visual direction has a snappy sense of genius to it that doesn’t seem too different from the humour of the entire movie, and while Megamind’s schemes may not always be successful, this is one animation that is.